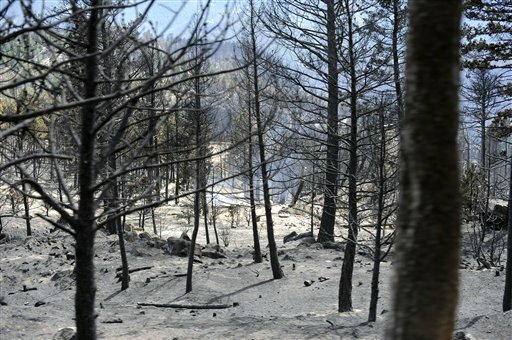 BOULDER, Colo. (AP) – Fire managers are confident they’ve stopped a wildfire burning in the Colorado foothills from spreading, but people who live in the blaze’s path still didn’t know Saturday when they would be able to return to their homes – or what remains of them. The fire has destroyed at least 169 houses and is burning on a 10-square-mile area in canyons 5 miles west of Boulder. About half the blaze’s perimeter now has fire lines built around it to keep sparks from spreading the flames to the area beyond. Crews hope to have the fire fully contained by Monday thanks to calmer winds and the work done by about 1,000 firefighters from 20 states in digging those lines. “We’re thinking this fire is not going to move,” fire spokesman Terry Krasko said. Firefighters focused Saturday on putting out fires within the perimeter, Krasko said. The latest infrared flight done over the burn area showed several areas of isolated heat but no large pockets of intense heat, as previously seen. No smoke could be seen coming up over the ridge where the fire was burning Saturday and the weather was calm after two straight days of gusty winds. In another sign of progress, Krasko said eight of the approximately 110 fire engines working on the fire would be allowed to return home Saturday. Winds gusting up to 40 mph on Thursday led to fears that the fire might spread into the city of Boulder, prompting officials to warn residents to cut their lawns and clear away wood piles and also consider making preparations in case they had to evacuate. The fire lines held and no evacuations were needed. Jim Thomas, leader of the federal incident response team, said the low winds Saturday will make it easier for crews to attack the flames. Firefighters, however, were still facing warmer-than-average temperatures in the 70s and low humidity. Authorities believe the blaze was human-caused. They are looking at whether a vehicle may have crashed into a propane tank. The loss of homes surpassed that of the 2002 Hayman fire in southern Colorado, which destroyed 133 homes and 466 outbuildings over 138,000 acres. Insurers had no immediate estimate on damages as rubble smoldered in mountain neighborhoods filled with a mix of million-dollar homes and more modest log homes and ranches. Carole Walker, executive director of the Rocky Mountain Insurance Information Association, said the blaze affected mostly primary residences, not vacation cabins, so the homes burned are more likely to be insured. The wildfire has destroyed at least $76.9 million worth of property, according to a Boulder Daily Camera database of the buildings confirmed burned and their valuations listed in Boulder County property records.